The key to making a profit by running a bar is to make sure that your bar is always kept clean and organized. Cleanliness, organization, and efficiency will increase your profits and the reputation of your bar. The following is a checklist of things that need to be d one to keep your bar organized and looking good. The profits from running a bar come predominantly from the alcoholic beverages that customers order. If there are no glasses with which to serve customers, a profit cannot be made. Glassware is used quickly at a bar, so it is important to clean bar glassware continually, throughout the workday. If too many glasses accumulate, it can be difficult to catch up when glasses are needed. The bar staff should at the same time, make sure that bar equipment, such as the ice machine and beer taps are kept clean and that ice is always available and beer flowing smoothly. Keeping the surfaces of the bar cleaned at all times using bar towels adds to the reputable image of your establishment. If your bar surfaces are sticky, messy, or wet, customers may feel uncomfortable ordering drinks. People will usually equate the quality of your food and beverages with the cleanliness of your bar, so take specific measures to keep surfaces cleaned with warm water. At the end of the night, be sure to sanitize surfaces to remove germs and grime. 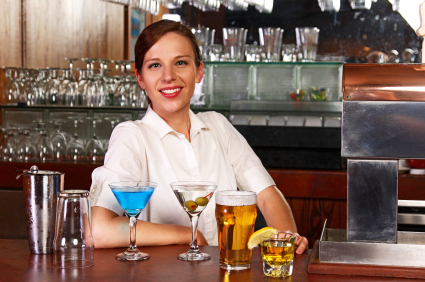 Make sure each employee is responsible for his or her area of the bar, so no mix ups occur and the entire bar is covered. It is crucial for waiters and waitresses at a bar to continually remove dishes and glassware with the apprpriate bussing supplies after they have been used. If there are tables, then each of the wait staff is responsible for her or her tables. There are two major reasons for this continual clearing. First, customers are less likely to continue ordering drinks and food if their tables are cluttered with empty dishes. When you keep a table cleared of empty dishes, customers will feel free to continue ordering. Second, for the sake of bar customer turnover, if customers can quickly find seating when they enter the bar, this will ensure higher bar turnover and profitability. Tables that are cluttered with empty glasses and plates are simply uninviting to customers. One of the most important parts of successful bar operation is to maintain regular inventory lists. Inventory lists are usually kept and maintained by the bartender, as he or she is the person most familiar with the amounts of liquor and other drink ingredients on hand. If your bar offers food to customers, a separate inventory list should be kept for kitchen supplies by the kitchen staff. The most common cause of overspending in a bar is a poorly maintained inventory list. Unless the supplies you need are listed in an orderly fashion, it can be easy to miss a bottle of liquor and order more than you need. Over-ordering can cause a bar to lose money, whereas under-ordering can leave a bartender unable to make a specific drink for a customer. A bar should be run like an efficient machine. Regularly cleaning glassware, clearing dishes and maintaining bar equipment, will ensure that paying customers always have a place to sit and enjoy their beverages. A clean bar is much more inviting than a wet or dirty bar. Finally, keeping updated bar inventory lists will ensure that a bar never runs out of needed supplies.